The Security Protector Plus is a completely wireless security system package that doesn't require any expensive monitoring services. When the alarm is triggered, the system will call your cell phone, work phone or even call a neighbour and announce that there's an alarm condition. When you answer the call, you even have the option of listening in to the house to see what's happening! If you're looking for some peace of mind from a security system that's simple to install and set up, then look no further. When triggered, the Protector Plus Voice Dialer security system sounds a loud built-in siren, flashes a light plugged in to the included X-10 lamp module, and automatically calls up to 4 pre-set telephone numbers to provide your home & family with maximum protection. You can have it call your cell phone, work phone or family or neighbours. When the system calls you, it's also possible to listen in to the house to see what's happening! The system comes standard with 2 door/window sensors and 1 motion sensor and can be expanded to 16 zones/sensors in total. The security system can be armed/disarmed from the included security remote, or the keychain controller. Includes: Main Console, Security Remote, 2 Wireless Door/Window sensors, 1 Wireless Motion Detector, 1 Keychain Security Remote, 1 Lamp Module. Sensors are all wireless -- no need to run any wires through walls! 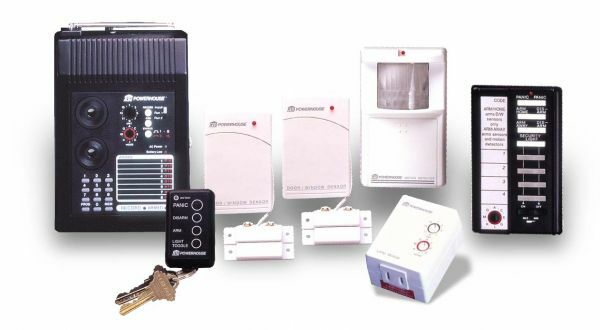 Alarm condition sound sirens, flashes lights and dials up to 4 emergency numbers. Batteries not included, should be replaced in sensors annually.